In 2016, we will honor the centennial of our National Park Service. We will celebrate our National Parks, along with the employees and volunteers who work to hold the Parks in trust for generations to come. An important part of that trust includes preserving and managing each Park’s wildlife. The National Parks have played a key role in the preservation of the American bison, commonly known as the buffalo. In the 16th century, North America was home to 25 to 30 million bison, making the American Plains Bison the most abundant single species of large mammal on Earth. The Plains Bison is a “keystone species.” The trampling and grazing of these thundering herds actually shaped the ecology of America’s Great Plains. 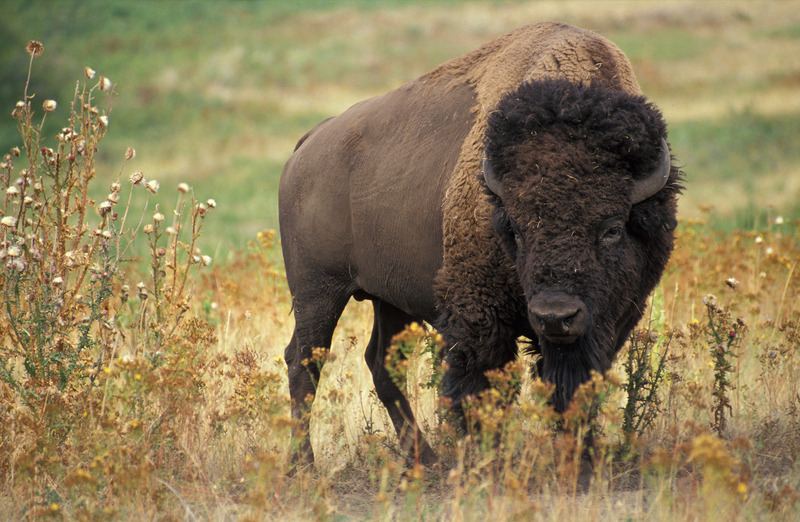 A bison can weigh over 2,500 pounds, jump six feet vertically, and run 40 miles per hour when alarmed. This is an impressive animal. The bison played a crucial part in the lives of Nomadic Native American peoples. One bison could provide 200 to 400 pounds of meat, as well as hides, robes, and sinew for bows. Hunting was accomplished on foot and on horseback through herded stampedes over buffalo jumps. For an accurate and detailed account of Native American hunting methods, along with art and photography, see this blog post at www.nativeamericannetroots.net. Hunters thanked the animals with rituals and prayers for the gift of their lives. The Natives, the herds and the habitat thrived. Two hundred years later, the bison was hunted nearly to extinction. 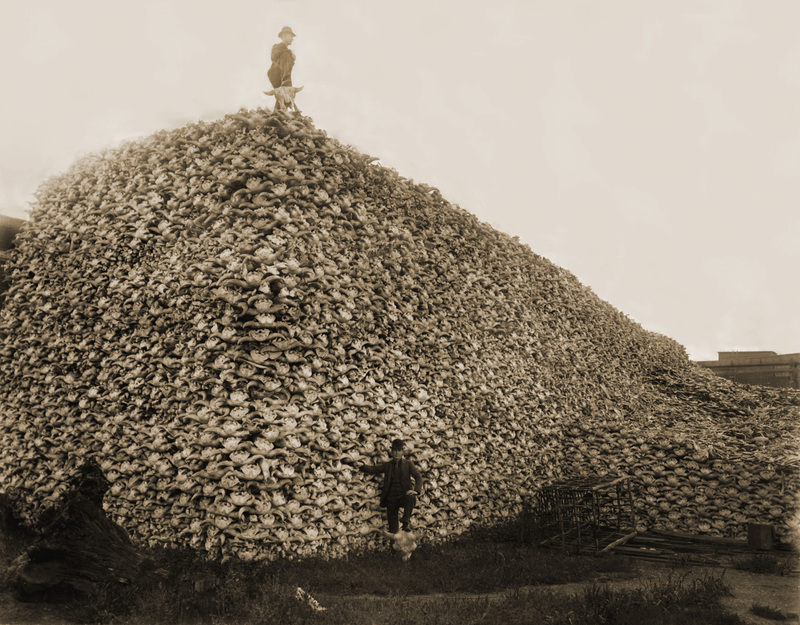 Decimating factors included loss of habitat due to farming and ranching, and industrial-scale hunting by non-Natives. The systematic destruction of the herds was promoted by the U.S. Army in order to strike an irrevocable blow to the way of life of the Plains Nations. The loss of the buffalo was an economic, cultural, and religious tragedy for the original inhabitants of North America. It was also a great loss to the natural ecology of the Great Plains. Somehow, tiny “relict” herds survived. A few ranchers attempted restoration of the herds through private ventures in the late 1800s. Samuel Walking Coyote (Pen d’Oreille) started a small herd with seven orphaned calves he found west of the Rocky Mountain Divide. Another herd was formed from this initial group, and in the early 1900s, small herds were sent from this second herd to Canada’s Elk Island National Park, and the Wichita Mountains Wildlife Refuge in Oklahoma. Left to graze in protected wilderness and park areas, the buffalo began to rebound. The Yellowstone Park Bison Herd formed naturally from a 23 bison that remained in the park after the massive slaughter at the end of the 19th century. This is the only continuously surviving herd in the Americas, and the largest at over 4,000 head. There are preservation efforts in many wilderness areas and National Parks, in part due to the beneficial effects of bison on regional ecology. Unlike domestic cattle, bison herds cultivate rather than deplete the native grasses through grazing. 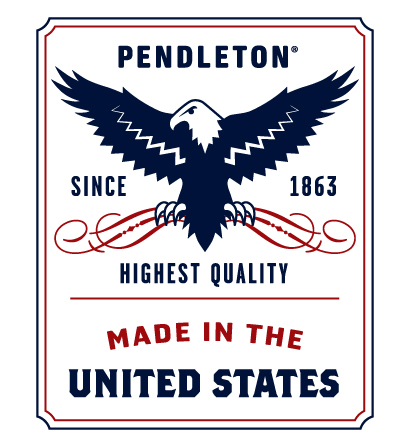 Because of the close relationship between our national wilderness areas and the American bison, Pendleton commemorates this impressive land mammal as part of the Pendleton National Parks Collection. 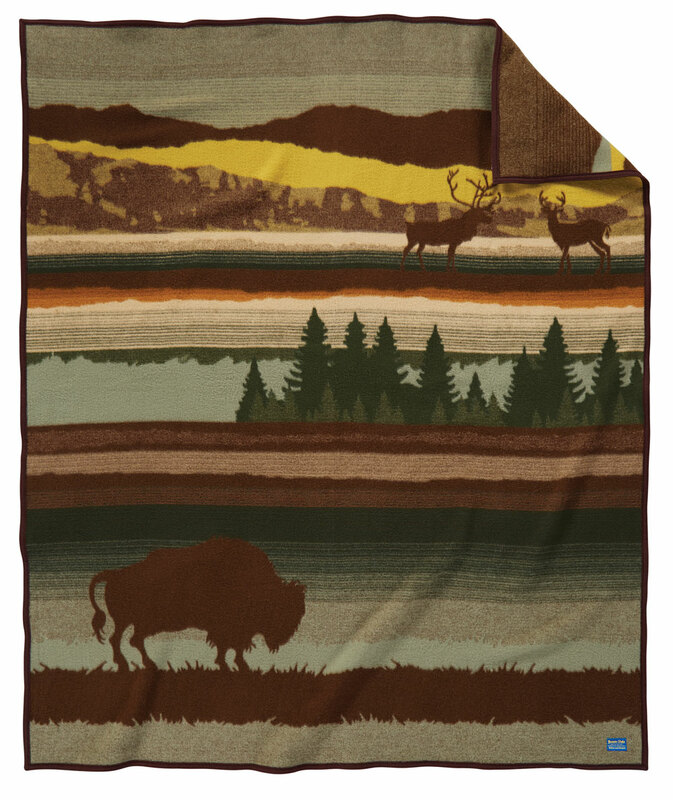 Our newest buffalo blanket, “Buffalo Wilderness” celebrates the resilience of a magnificent animal and its role in shaping the Great Plains. 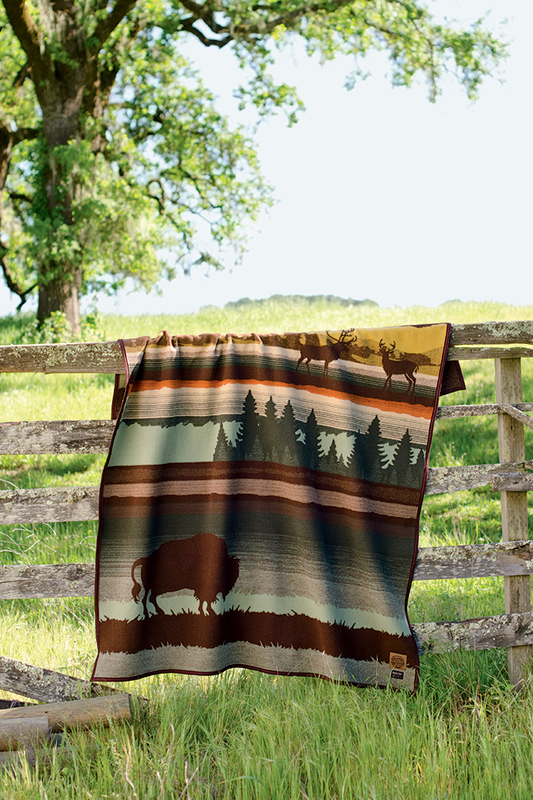 The Buffalo Wilderness design recalls a time when millions of buffalo roamed grassy plains from Oregon to the Great Lakes, from Canada to Mexico. Today our National Parks protect the wilderness, and the buffalo herds can roam free. One of the largest herds (more than 4,000) of free-ranging wild buffalo lives in and around Yellowstone National Park. It is thought to be the only place in the United States where bison have lived continuously since prehistoric times. You can also see herds in Badlands, Grand Teton, Theodore Roosevelt and Wind Cave National Parks. You can get more information on the blanket here. And remember, the purchase of items from our National Park Collection helps support the National Park Foundation. More information here. ← Happy Father’s Day. Sometimes, a picture says it all.